Puddleduck in Fritton, near Great Yarmouth sleeps 4 people. 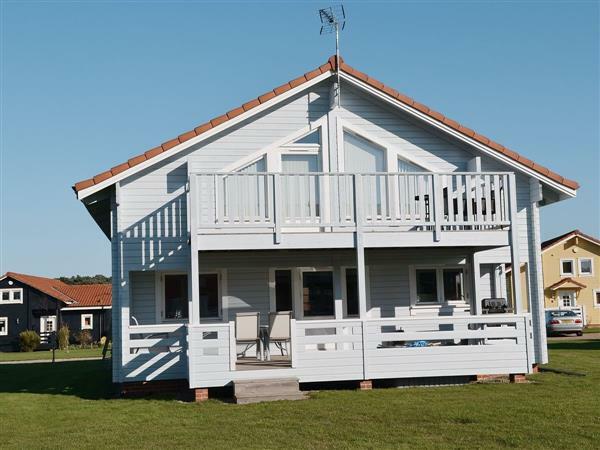 Puddleduck is a charming property which is part of the exclusive Fairway Lakes Village, a Scandinavian-designed wooden lodge development overlooking the fairways of the 400-acre Caldecott Hall Golf Club. From Puddleduck, with its hot tub, you can enjoy views across the undulating countryside and golf course, making this a special place to relax and unwind. The site offers two 18-hole golf courses and driving range, a clubhouse and bar (restricted opening times) and The Barnworks Fitness centre and Spa offers a wide range of facilities, including spa sessions and an indoor heated swimming pool. Both the golf and spa offer concessionary prices. Catch and release fishing in the lakes is permitted on request. Nearby, Redwings Horse Sanctuary is within walking distance and is worth a visit, as is the famous Somerleyton Hall. A short drive away will take you to Great Yarmouth for family fun, and the medieval city of Norwich with its cathedral, castle, fine shops and museums is not to be missed. Visit the market towns of Beccles and Bungay, plus the lovely harbours and seaside resorts on the North Norfolk and Suffolk Heritage coast are easily accessible. The beach is 6 miles. With the shop being 3 miles; the pub and restaurant are 1 mile from Puddleduck in Fritton. Ground floor: Dining room with French doors/kitchen with wooden floors. Utility room. 1 twin bedroom. Bathroom with shower over bath and toilet. First floor: Living room with French doors and wooden floor. 1 double (5ft) bedroom with en suite shower room and toilet. Gas underfloor central heating, gas, electricity, bed linen and towels included. Cot. High chair. Two Freeview TVs. DVD. iPod dock. Gas hob. Electric oven. Microwave. Washing machine. Dishwasher. Freezer. Wi-Fi. Sitting-out area and furniture. Barbecue. Parking (2 cars). Shared hot tub. Welcome pack. No smoking at Puddleduck in Fritton. For a better idea of where Puddleduck is, you can see Puddleduck on the map below. Puddleduck is in Norfolk; should you be on the lookout for a special offer, you can find all the special offers in Norfolk. It's always worth checking to see what is on offer at the moment. Do you want to holiday near Puddleduck (30542), you can see other cottages within 25 miles of Puddleduck; have a look to find your perfect holiday location.